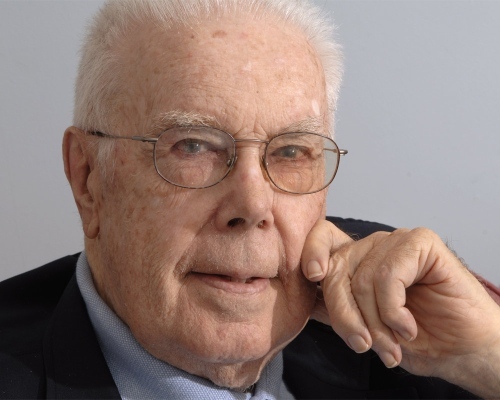 anyone else in his party - battling for labor, education and health causes, has died. He was 90.
after ailing in recent months. home that now bears his name. 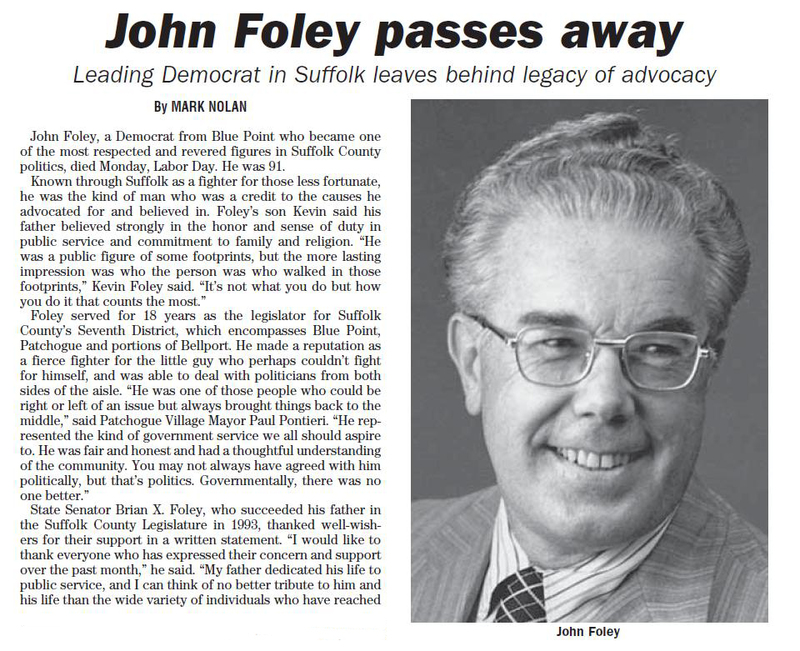 "John Foley was a public service legend the likes of which we will never see again,"
said Richard Schaffer, Suffolk Democratic chairman, "He was a superimposing figure . . .
and had even a bigger heart to go along with it." "He always tried to be the teacher, educating us on his point of view," said Legis. day Foley's wife of 49 years, Mary, died. A court ruling later halted the law. Democrats win control for the first time in decades. "In a world with so much negativity,"
very positive role to help people's lives." preschoolers with learning disabilities and improved mental health services. education, and a trustee of Suffolk Community College. athletic director of Suffolk County Community College. he served stateside in the Army medical corps during World War II. and a funeral Mass was offered at Our Lady of the Snow Parish on Saturday at 10 a.m.
Brookhaven Hospice, St. Ursula Center or Mercy Center Ministries. It was well after midnight one August night 1988, when Suffolk lawmakers were deadlocked over the fate of a community college budget - one vote shy of the 14-vote, supermajority needed to pierce the county's spending cap. With tempers frayed, then-Legis. Steve Levy lashed out at his older colleague John Foley, a supporter of the extra funding, only to be blocked by the lawmaker's aide and son, Brian. "Your father never saw a nickel he didn't want to spend," said Levy, now county executive, who had to be separated from the younger Foley, now a state senator. 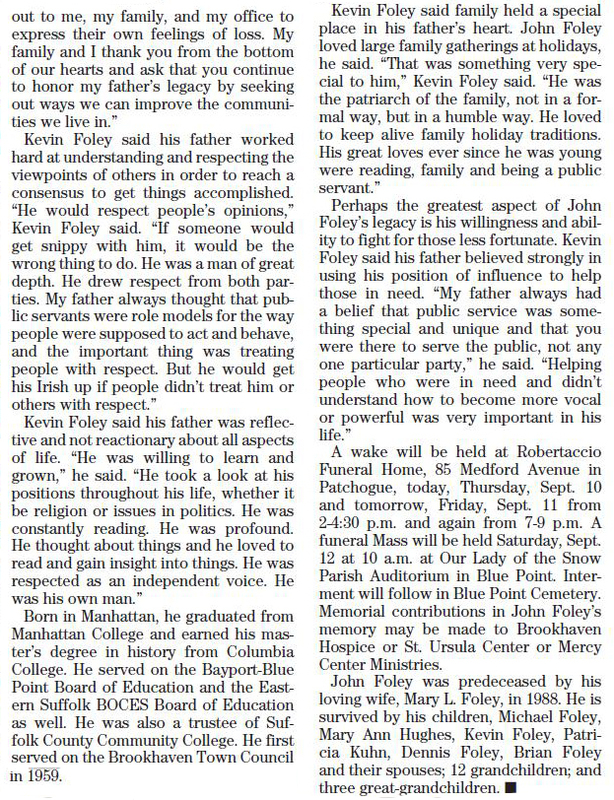 Such criticisms dogged John Foley, 90, who died on Labor Day and was buried Saturday, for much of his four-decade public career. But it never seemed to bother him or his record 18-year tenure as the legislature's longest serving Democrat. 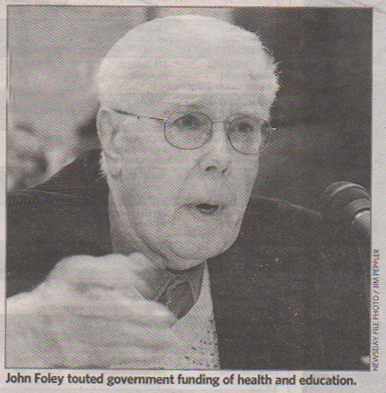 Borne of a Depression-era upbringing and a deep Catholic faith, Foley believed government should invest in health and education, and that all shared responsibility to help those in need. But he also believed taking care of such problems early was less costly in the long run. He championed Suffolk's local health centers to avoid choking the corridors of more costly emergency rooms. He backed diagnosing preschoolers for learning disabilities so they could be dealt with before they entered school and fell behind. He pressed for funding for mental health programs to avoid the ruin such ailments often bring. "He was honest and firm and knew what needed to be done," said Nancy Marr, president of the Brookhaven League of Woman Voters, who was part of a health center advisory board in the lawmaker's district. Hundreds, including former Gov. Mario Cuomo, attended Foley's funeral Saturday, a spare ceremony with no eulogies designed by the late lawmaker. Readings included parts of the Sermon on the Mount, where Jesus blessed the merciful, meek and those who serve for justice's sake. His family read Foley's request for prayers that invoked activists from Martin Luther King Jr. to Dorothy Day. The Rev. Edward D'Andrea, pastor of Our Lady of Snow Church in Blue Point, said "Thank you God, for John, a true citizen of heaven and earth." When former County Executive Patrick Halpin tried in 1990 to close the old county nursing home in Yaphank, Foley not only stopped him but secured a new complex, which now bears his name. "When it comes to this human question, people are saying we can't afford it," said Foley. "What they are saying is we can't afford to take care of the poor and near poor." 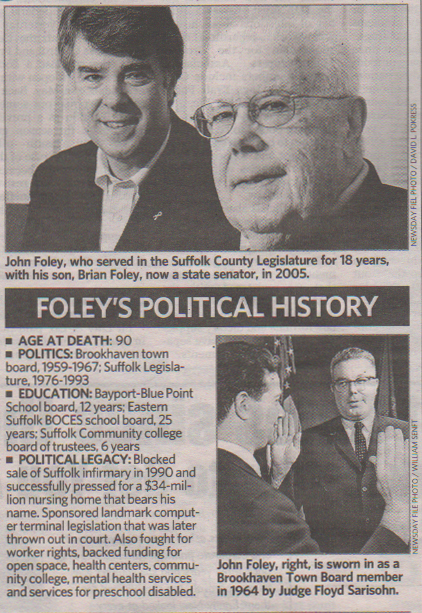 When Halpin earlier opposed a controversial 1988 bill to regulate the safety of computer terminals in part because of its impact on business, Foley retorted, "Suffolk is a good place [for business] because we take care of our people." Foley won an override of Halpin's veto, on the same day his wife of 49 years, Mary, died, though the law was later thrown out in court. Dubbed the "Monsignor" for his reserved lace curtain Irish demeanor, Foley could bristle, particularly when a testifying county official was caught withholding information. But he could also melt foes with a puckish look, or his Cheshire Cat smile. Even Levy last week acknowledged Foley as a formidable foe. "Whether you agreed or disagreed with John's philosophy, you always respected he was a true believer who fought hard for what he thought what right." Foley's son, Kevin, said his dad also infused his family with concern for the larger world. "We grew up in a house not only knowing the needs of local constituents, but what was going on in Latin America and Africa." Yet the son also said his father loved the "breeze of the bay." And for those of us from his hometown, Blue Point, his most lasting gift may be a 22-acre stretch of woodland and beach on the Great South Bay that Foley convinced the state to buy years ago. 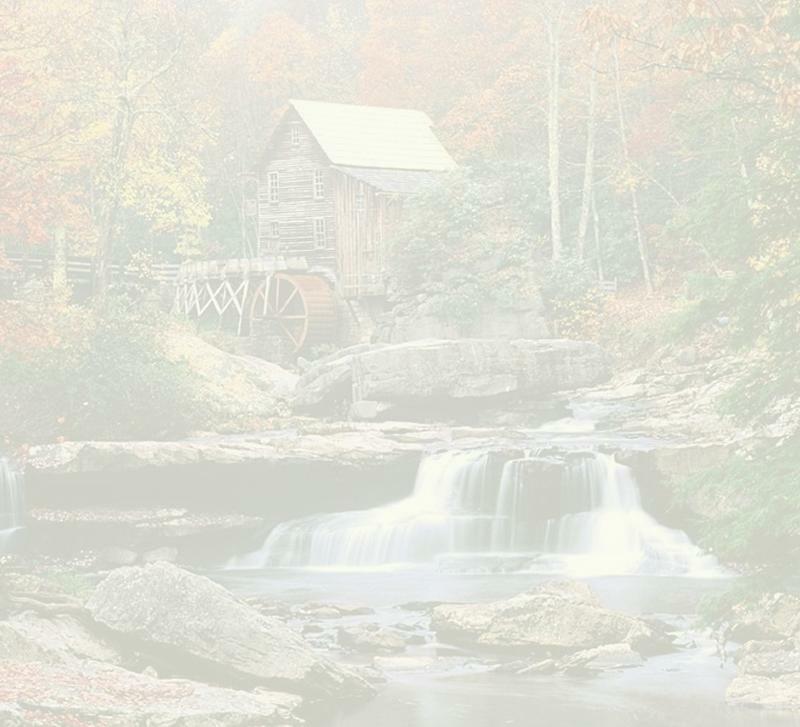 With a stream running through, it is a natural refuge in the midst of a middle class neighborhood. It clears the mind and heals the soul. Every time I walk there, I think of John Foley. And I say thank you.